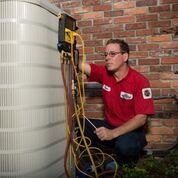 Jim Higgins, Roussos Air Conditioning staff member, became NATE-certified for Air-to-Air Heat Pump. Roussos is a top notch operation. They will stand behind their work with a solid guarantee. Their service techs are clean, friendly & very well trained. I am very satisfied with their performance.